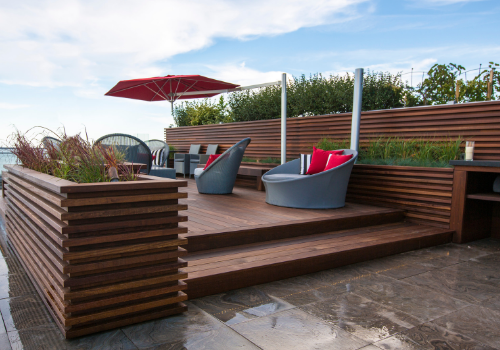 Super decks Toronto, supplies and install commercial and institutional decks projects, we work with several Landscaping architects’ firms and companies. 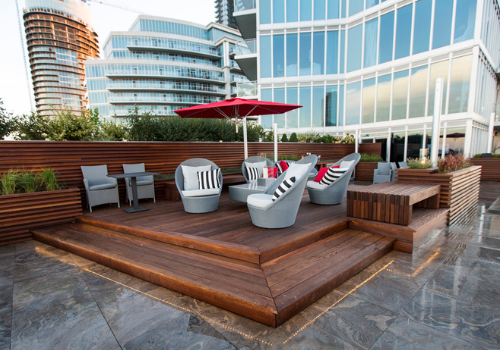 Our deck building expertise has been put into contribution in major high-level projects, where commercial and institutional decks, rooftops, condos, plazas, where high-performance decking and substructures are needed for extensive foot traffic. We have executed several decks construction projects for various clients in the retail, corporate, condos, recreative, parks, etc., and built a solid reputation for consistency, efficiency, and excellence. We hold all our commercial decks projects to rigorous standards for safety, quality, and client full satisfaction. As a deck contractor, we know that commercial decks construction has special requirements, we ensure that our decks projects meets all the building codes and requirements. As a specialized deck builder & contractor for residential and commercial projects, we offer the best workmanship and decking materials available, our projects managers can assist in the conception and design of your commercial deck project. We can design and prepare shop drawings and have the manpower and expertise to deliver your project successfully and on time! High quality decks construction projects result from careful planning, co-ordination and co-operation. Super Decks Toronto can pull it all together to deliver your project on time and on budget. We have been established for over 10 years and our management team has earned itself an exceptional reputation for ability, collaborative relationships, safety and completion of projects.